Colour genes and their subsequent varieties are a subject that can be widely and hotly debated. 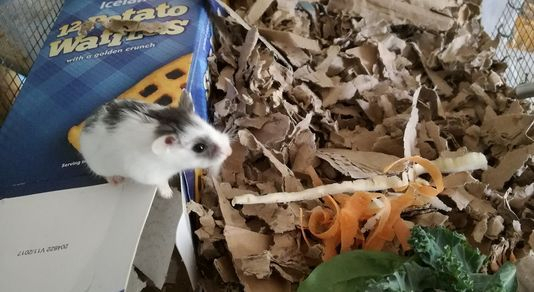 Thankfully the National Hamster Council goes to great lengths to make sure that recognised mutations and standard colours are vetted and approved. A breeder must go through the process of proving how a gene is carried and what it does as well as what it looks like, thoroughly. I'm proud to be part of an organisation that promotes such responsibility amongst it's breeders. The content of this page is intended to be descriptive for pet owners and those new to the fancy that are looking for information on varieties. It is not intended to be informative for experienced breeders, and does not contain genetic codes or similar. This information is already available from websites within the clubs and is learned from members at shows during your journey to breed. This information is intentionally basic, if you would like further clarification do feel free to contact me. 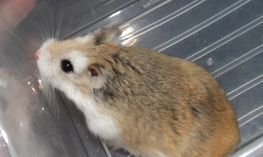 Roborovski are small and should not be bred to be Campbell sized. Guidance on standard sizes are in the handbook and breeders/exhibitors should refer to these. Don't end up too tiny either! One of the biggest issues seems to be breeding over shouldered robos. This makes them look like little tasmanian devils (think of the cartoon) so very big and chunky at the front with no body over the back legs. This is a horrid looking body type that is difficult to correct. Roborovski should be in proportion all around so they look oval shaped from above but not too long. Heads should be as broad as possible between the ears, and not too pointy. However, breeding for excessively blunt faces should be avoided as this reduces the space in the skull. Males tend to be a bit larger than females and do suffer from staining underneath when older. 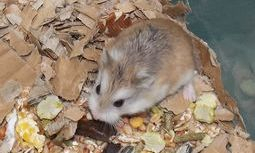 The wild, or natural colour of the Roborovski hamster is referred to as 'normal' and means agouti. I find the agouti robo adorable, especially with those white eyebrows! Normals are best paired with each other for the best colour, a sandy brown described in the handbook. If paired with pied, you risk a hamster with small white spots on the cheeks, shoulders or bottom. I've seen these described as 'dominant pied' when they are actually mismarked normals or overmarked pied Roborovski. 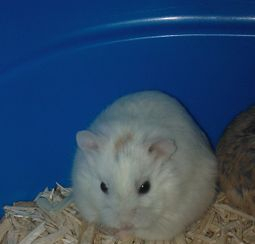 For the new exhibitor, check your agouti hamster has defined white eyebrows and no spots! Sometimes the colour is missing from the face. 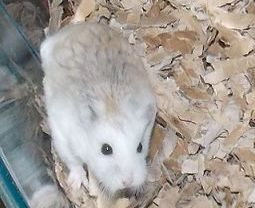 It's still unclear, and unproven, whether this is another example of an overmarked pied hamster. When paired with husky, anecdotally it pales the colour but in reality a recessive gene should not have an effect on colour when only one copy is present. It's more likely that animals are not being selected for colour so bear this in mind. Images show a young normal robo that was bred here, Paisley and Grace who are both adult females. Notice the colour runs all the way down the nose and also take note of the arches over the shoulders. These are correct. It's normal to have white behind the ears. I will write about the recessive pied gene as this appears to be what we have in the UK. I've certainly seen no evidence of a dominant pied here. Pied is a spotted or mottled pattern that can currently be seen in agouti or husky. This gene is recessive so you can produce pied pups from two agouti parents who carry it. The standard has been submitted for review and is awaiting a Standards Committee meeting at time of writing. Pied is best bred to normal agouti or another pied and there doesn't appear to be any health issues in breeding two patterned robos together. Husky pied is a lovely blonde spotted animal but it's best to keep this as a seperate line so as not to end up with the two recessives permeating other lines. Show wise pied is still in non-standard so competes with other species of dwarfs that have had longer input into type. Non standard robos may not do well in this class as yet. Ideally, in my opinion, pieds should have some kind of spot on the face so as to look appreciably different to a husky (or whiteface) animal. Below are photos of adult male and female agouti pied robos. You can see a large variety of pattern and colour quality. Variations like these do not denote a different gene, we see variations in all species and their range of colours/patterns. Personally, I prefer the pattern in the middle photo and the colour of the left. The right hand female shows the classic 'cap' of colour followed by a white band around the neck and a large block of colour on the back. In my view, like with mottled Campbells, this type of distribution in the pattern should be avoided. Instead, multiple clear spots or patches should be aimed for. Husky robos in the UK appear to be of the recessive type so I will write about that as I've not seen any evidence of a dominant husky animal. At the time of writing, a husky standard has been submitted and is waiting approval. It is a recessive gene so can be produced by two parents are not husky. Husky appears to dilute the coat and makes an agouti robo look blonde. In addition, colour is removed from the face. It is my belief that this is a pattern rather than a colour gene, although I am aware that others hold different views. That's the joy of hamstering! Debate is indeed welcome with any variety as this helps us prove how these genes work and what they are. Ultimately, breeding will out and until we find other colours or patterns we have limited information to base theories on with this species. Note that the recessive husky does not fade with age or turn white when older. This is a finding common across many lines and breeders in this country but is still something I get asked about regularly. Husky is a pretty colour, and somewhat sticky as a recessive so is often avoided. So much so that, for much of 2015 huskies were incredibly difficult to find in the UK. Indeed in other countries too. 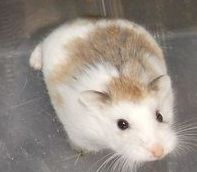 Combined with pied, husky produces a lighter coloured spotted hamster, minus colour on the face and with colour not descending as far down in the flanks and rear. Husky pied line should be kept apart from agouti pied lines so as to not to end up losing your line to multiple recessives. There appears to be no issue mating two huskies or two husky pieds together, both producing healthy young assuming the health status of the line is good. From a show perspective, huskies are in non-standard at this time and tend to be marmite with judges. Again, working on type to win this class produces a wide variation in colour quality that should improve with more breeders taking it on. Caution should be shown on labelling a well coloured husky as a different variety. Caution should also be shown when viewing photographs. For example, all the robos pictured below are exactly the same colour. Different sexes and ages but all the same colour. Camera flash or daylight can play havok with a husky's photographs! Selection for colour is all that is needed to see a balancing of colour quality on the show bench. An unrecognised mutation that is not new, but again not been submitted to the UK Standards Committee. Breeders are working towards this and the information here will be updated once breeding has shown this genes characteristics. 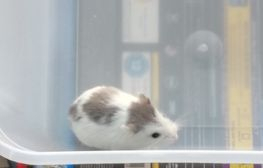 Below are photos of young adult, agouti red eyed pied or cinnamon pied depending on who you ask. The photo on the right shows a black eyed pied and red eyed pied in the same tub and clear differences can be seen in colour. No doubt the biggest debate will be whether to call this gene argente or cinnamon but as cinnamon is so widely used on the continent then it would make sense to carry this on. This variety cannot be sold at a show or shown in non standard. At the time of writing, the headspot robo is not well understood in the UK and therefore cannot be entered into main class. Breeders still need to show that the genes that make up this variety are recognised already. From the photos below you can see a very wide range of markings from nearly white through very pale and then a nice dark spot. What is clear to me is that husky is not involved with this variety as the spots are most definitely agouti coloured and not blonde. The flesh coloured ears are also intriguing as no other variety has these. A lot of logical breeding work is needed to show how to make a head spot, certainly it isn't a simple variety but one I'm excited to work with again. The first litters I had from a headspot in 2012 gave me the only husky pied I've ever seen to fade to white. That's not something our regular huskies/husky pieds do so isolating the gene that does this should be a priority so that we can catch up with our continental counterparts in how many varieties of robos we have on the show bench. It may also be connected with how other breeders have previously bred so called 'husky whites'. Brand new in the UK from Holland and Germany, blue and blue agouti roborovski first arrived here with me! Not much is known for sure other than it appears to be recessive. More breeding work needs to be done. These animals are best bred with agouti for now as they are currently only seen as patterned (pied) and cannot be recognised until they are in their natural, agouti form. Below are photos courtesy of Bonder Exotics and Piccoli Amici. The photo on the far right being a dilute agouti imported to my hamstery in November 2017. The last photo is Jauffre, the first black Roborovski bred here at Doric in the spring of 2018. More breeding is needed to prove this gene for recognition in the fancy. Black out of blue suggests it is the same gene that is found in other species, a recessive melanistic that has popped up with a dilute gene. We should expect self blue (black + dilute) or dilute agouti.